Good Day or Good Evening to my Little Dracula Information Vault. Little Dracula story; I beileve it started with little horror children books. Little Dracula's First Bite,Little Dracula at the seashore,Little Dracula goes to school,Little Dracula's Christmas,Little Dracula's Joke Book,Little Dracula's Monstrous Poster,& Little Dracula Other Monstrous Poster. Then Little Dracula had a short little cartoon series on Fox Kids back in 1991 (& yes I do mean short; the cartoon was only on for like a week & plus a day on Halloween). Then there were Little Dracula toys & costumes and a Mini Comic book series. There was a recent time (like 1999-2000), where you can only see the Little Dracula cartoons on as one of 13 days of Halloween specials on the Fox Family Channel.There are even eps. that they didn't air in the 1991 time. **Sadden** I did love this cartoon & his comic book series and so on. I have such a soft spot for Dracula Cartoon shows. I use to get into Count Duckula as well. 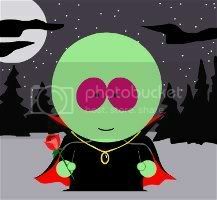 My guess to why this show didn't do to well, is the fact that, Little Dracula will bite & as well as his family and it brings back the mean Dracula image.Which is the true and rightfully image for Draculas & Vampires.But as a person that took Early Childhood; I can see how little kids could not like it *sighs*. Unlike Grampa from the Munsters,The Count from Sesame Street,Count Chocula or Count Duckula that show a more friendly image of Vampires. What ever happened to Sailor Comet's Little Dracula Wavs Sound Vault? Answer: It was hosted by Geocities and I just cutted and pasted my stuff to Angelfire. I no longer have the same stuff to make the wav sounds anymore (for why I nevered made any new ones). Also, I dumped my Sailor Comet name a long time ago. I like to go by Hayley B and decided to just make this a little information page about Little Dracula. Not much of a gimmick here now, I know . But I just love to let Little Dracula know, that he has a fan out there and hopes to find many more with it.